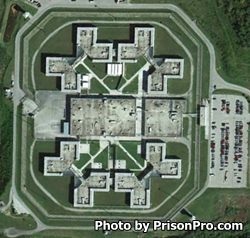 Red Onion State Prison opened in 1998 and is a Super-Max prison located in Pound Virginia. It has a capacity of 848 male inmates. Red Onion State Prison houses some of the most violent and dangerous predatory type criminals in the state. Inmates who have are difficult to manage and present disciplinary challenges at other facilities are sometimes transferred to Red Onion. Over two thirds of the offenders at Red Onion are held in isolation, and are alone on lock down in their cell for 23 hours per day. All food is served through a slot in the door, inmates are allowed out for one hour each day for exercise. Due to the overwhelming danger these offenders present programming is limited, and often delivered via video on CCTV. Offenders can receive GED classes and participate in a literacy program. Inmates may be selectively chosen to work as custodians within the facility. Red Onion State Prison has been criticized for the treatment of inmates, and some human rights groups claim the solitary conditions inmates are held under equate to cruel and unusual punishment. Inmates who are located at Red Onion State Prison and want to be transferred to a different facility need to complete the 'Progressive Housing Phase Program', and display a high level of compliance and good behavior. Red Onion State Prison is where Lee Boyd Malvo, better known as the 'beltway sniper' is currently incarcerated. Inmates at Red Onion State Prison are allowed four hours of visitation per month. Visits are by scheduled appointment only, contact the facility at the telephone number provided for more information.